Am I a knitter or a crocheter, or am I a bit of both? Its funny how even in the past weeks, my answer may have changed to this question. I am definitely more of a crocheter than a knitter, but as I said on yesterday's post, I am finding I have a growing love for knitting. I think it is down to the fact it makes me feel challenged and it isn't a breeze......don't get me wrong, it doesn't stress me out so much, that I don't enjoy it.....it just keeps me on my toes. I haven't taken on anything beyond simple stitches so far....(and that has still dumbfounded me! )....but I love the way the stitches form patterns......I love the higgledy-piggledy of garter stitch...the uniform points of stocking stitch......but when I discover more am I going to be drawn further in? I think to be honest.....I may be falling hard! So.....what happens with my projects now? Well, I love crocheting, the speed in which things grow, the 'instantness' of it all.......Hubby always says 'Here she goes again, bish, bash bosh I've made a blanket' and to be honest, he may have a point. I think I am fairly fast and somehow, the projects are more portable, as I don't have to concentrate quite so hard......not like dropping a stitch while knitting at the pool the other day, and everyone seeing my 'serious knitting face'! I think I will probably always dabble in both, and knowing my lack of organisation and order, I will probably have two many projects on the go at once.....but that's what makes life more interesting. 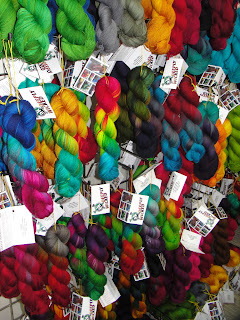 So.....the yarn above..........yep, bought the lot.....especially all the skeins in that first picture.......I wish! 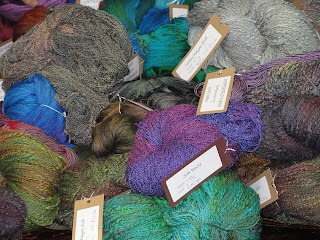 Wonder Wool was a feast for the eyes......but way beyond me.......I was totally overwhelmed by the colours, fibres, feel, weight, extravagance of it all. I walked round and around..... looking........ looking again....... walking away........ walking back..........I eventually came home with a few bits, but wowzers, what an event! My next project will be a knitting project....I'm not sure that means anything more than, my next project will be a knitting project........I remain a crocheter who knits I think.......and that's where I will try and find my balance. This post is part of the Knitting and Crochet Blog Week, and is the last in a week's worth of posts. I have loved every part of the last week, although I think my family may be glad that this is for a week, not a month! I have neglected doing crochet for actually writing about it.....bad times.....but I have learnt, been inspired and moved forward........good times. Thanks for all the kind comments.....you don't know how much they all mean......I am beaming from ear to ear! Knitter? Crocheter? I think you're just an all-round good egg! I think this may have been your best post of the week - and that's saying a lot! I really liked your description of garter and stockinette stitches - also the "instantness" of crochet (which is, I think, why I love it too). You are challenging me to knit a bit more. Thank you for that. Enjoy your beautiful new yarn! I really must give knitting a go this year- you've inspired me! I've just done my Wonderwool post as well. I know exactly what you mean, I was totally overwhelmed and didn't know where to start! I feel the same way about knitting, but I admit that I find it hard to "find time" for it, when it seems to need so much more time! Woweeee What a glorious post....all that lush yarn. Keep up the knitting, but i know what you mean crochet does grow quickly. What a great post...I think of myself as a crocheter as I feel at ease with it but even though I 'knit' I can't seem to think of myself as an actual knitter... still so much more to learn. (And you can pretty much see my 'serious knitting face' all the time while I'm clacking my needles)... I'm still just so darn slow!! I think I will forever flit between crafts as my mood changes... but will ALWAYS craft as it just makes me so happy!! Photography Challenge - if only you kn-ewe!